Damaraland Camp is situated at the Huab River and offers guests an oasis in this arid section of Namibia. It’s not often that one finds the best of both worlds in one place; luxury and rusticity of environment. In the backdrop is the Brandberg Mountain and ancient cracks in the earth that are now ravines and valleys littered with bush scrub and sandy plains. While the Damaraland might look stark, the Atlantic ocean is not very far away, although you might not know know it. 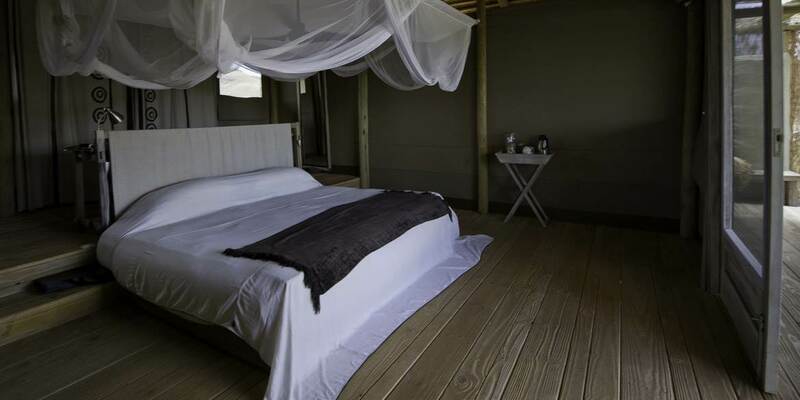 The beautiful camps at Damaraland lodge have been constructed using both modern and ancient methods. 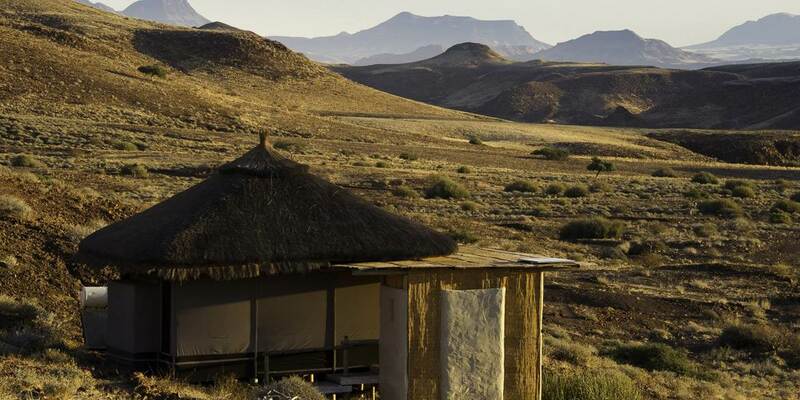 Accommodation at the Camp consists of 10 adobe-styled thatched units raised on wooden decking which form a beautiful and panoramic view of the valleys, plains and peaks of the Etendeka mountains. Guests can expect spacious communal areas, an open campfire and outdoor area (known as 'boma') which will ensure a clear view of the sparkling night skies. Intimate and elegant, Damaraland camp gives guests an authentic feeling of the bush and is the perfect place to meet people and share stories around the campfire. Although the game reserve is not concentrated all year round, the natural cycle of rainfall dictates the seasonal movement of wildlife along the Haub river. Damaraland camp is strategically situated where the rare but favorite desert-adapted elephants roam around along with other animals such as the ostrich, oryx and springbok. The early morning mists spawned by the collusion between the warm desert air of the coast and the Atlantic ocean usually glide along the river which ensures sustenance of the beautiful flora of the area. Some of the activities at the camp include exploring the Haub River by going on tour-guided nature drives, mountain biking and walks. Morning and evening game drives allow you to spot the amazing desert-adapted elephants, lions, cheetahs and the endangered black rhinos. A guided nature walk will teach you about the unique flora of the region and how despite the harsh climate, life can still be found in abundance. Namibia is well known for its history as the home of the Nama-Damara, the Herero and the Owambo people who are masters of their environment, a harsh one at that. 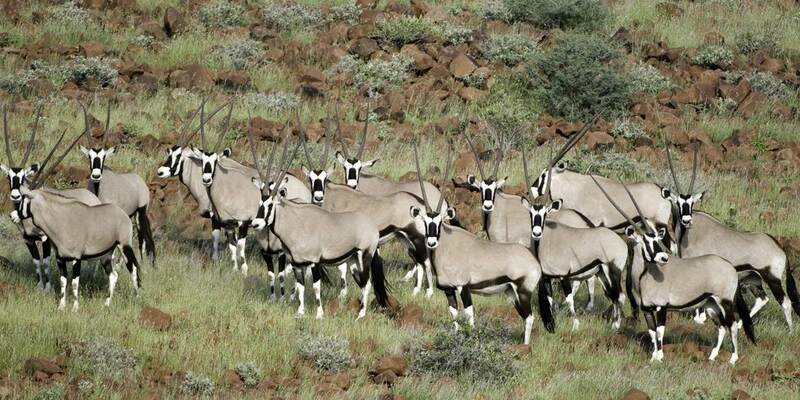 Their ancient traditions can be experienced during a cultural excursion to a nearby village, where you can learn a bit more about the varied cultures of Namibia. Damaraland is also home to incredible and ancient rock art, a testament to the old age of this land. Modern and elevated, Damaraland Camp offers guests the ideal oasis in the desert lands of Namibia. It is the perfect vantage point from which to explore the magic of Namibia.